Complete Educational Key Stage 2 Cross Curricular Resources. Eileen Noble B.Ed Hons. Primary School Teacher. We are a team of archaeologists, film makers and designers with 15 years of experience making heritage interactives. Though our voluntary work in schools, we have identified a need for quality interactive resources particularly to meet the needs of the new curriculum. 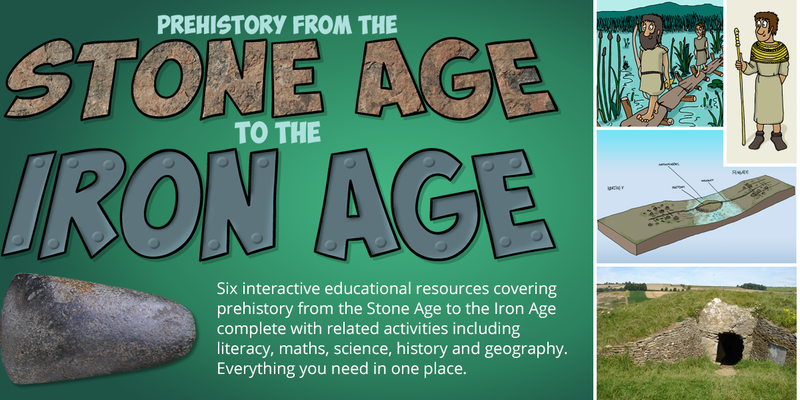 In response to this we have worked alongside teachers and other experts to produce a fun 6 week interactive resource for KS2 that covers the 'Stone Age', from the Palaeolithic period through to the Iron Age. With teachers notes and activities covering Literacy, Maths, History, Geography, Art, Design and Technology, and P.E. as well as cartoons, key facts, videos and further information, our aim has been to supply everything you need about each of these key periods in an easy to use 6 week topic module. Please register your interest via email for further information on future products and download the free Palaeolithic module from our Stone Age topic.